"We don't think it's gone, it's not dead". Despite the smartwatch negativity at the tail end of 2016, with the demise of Pebble, a supposed decline in Apple Watch sales and key Android Wear partners deciding to back away, Intel believes we are not witnessing the end of the time-telling wearable. Ethan Fassett is head of product at the tech giant, which has already helped usher in the first generation of Fossil smartwatches and has confirmed it is set to reunite with Tag Heuer for the Swiss watchmaker's next luxury smartwatch. Fassett is also taking the lead on the company's partnership with New Balance for the RunIQ Android Wear watch and believes that after a few rocky years, there are now clear signs things are getting better for the smartwatch industry. "The market is clearly in a transitional phase," he told us. "The simple problem with smartwatches initially was jack of all trades and master of none. It didn't really signal to the average consumer its key value. People found them to be gimmicky. "It's about focusing the device more. When we look at partners like Tag Heuer or New Balance, we see focus, we see a particular use case. While we work with more general smartwatch platforms like Wear, we try to add a layer of functionality on top of it so the utility of the smartwatch becomes more narrow, and it's more obvious to users why they need a smartwatch." 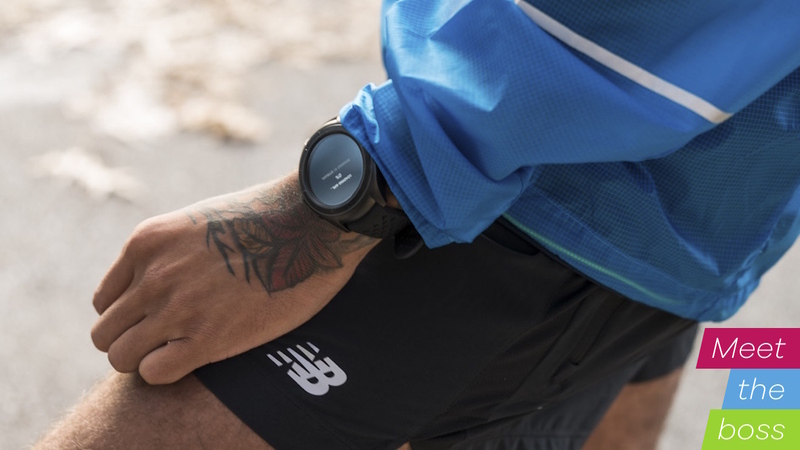 The partnership with New Balance continues a growing trend of non-tech brands reaching out for the expertise from companies like Intel to make a bigger push with connected devices, and it appears that the RunIQ smartwatch is just the start for the sports company. "The two companies started working together about two years ago as we tried to understand the digital strategy New Balance was trying to formulate," explained. "New Balance has a vision around a broader ecosystem around wearable technology and the way it can be embedded into things on the body to improve performance for athletes. So it can provide insights and be able to measure things you weren't previously able to. They see that as a progression of the apparel industry and athletic apparel and they want to be the lead out there. "It's very excited about getting into smart apparel and understanding how we can use the advances in wearable technology and other technologies to improve performance of athletes and everyday amateur level athletes. The smartwatch is the first step in a larger digital play." Making a smartwatch isn't easy work, and while Fassett doesn't blame a particular factor for the New Balance smartwatch missing its scheduled late 2016 launch (apparently it had nothing to do with Android Wear 2.0 being delayed), there were some challenges it had to face to get this complex piece of technology run ready. "When you're running, you don't want a lot of things on you," he explained. "In particular, if you wear a watch you don't want it to be obtrusive, or to weigh a lot. You don't want to potentially have to carry your phone with you. That was one challenge. The other was making sure the heart rate sensor works well. This is a notoriously tricky technology generally within the industry. We have a lot of expertise in that. We have engineers from the Basis acquisition who have been working on this. We've done a number of iterations to get it right. We are really pleased with how the heart rate sensor came out." Android Wear is the operating system we've been talking about the most in recent months, and that's because it finally looks like Google is set to launch version 2.0, arguably its biggest and most important update to its still-evolving smartwatch platform. Fassett is most excited about the performance-related improvements and the more flexible approach to building application layers on top of Google's platform. When it comes to working with Wear for a smartwatch designed for runners, a different set of issues need to be addressed to get the device to where it needs to be. "Android Wear is about creating a more fully functioning smartwatch that's not tailored like a Garmin running watch," he explained. "That's because the OS naturally takes more energy and is doing a lot more computing. We used a marathon run as a guide post as the bare minimum that we needed to clear, in order to have heart rate and GPS running continuously and to be able to have the battery last for roughly five hours. "That's an average to not-so-great marathon time. If you are also streaming music, it won't last the full five hours, but that's okay because we didn't believe the marathon use case would require to have continuous music play. We do address the use case wanting to run for 45 minutes in the day and still wanting to use the GPS, heart rate and music. That's how we distinguish it from a Garmin watch, where the OS on these types of watches are completely narrowly tailored to just running use cases. They don't handle the general smartwatch functionality for the other 23 hours of the day." Launched back in 2015, Intel teamed up with the Swiss watch maker for its first Android Wear smartwatch. Tag Heuer has confirmed that two new Connected smartwatches will land in 2017 running Android Wear 2.0. Before Fossil bought Misfit, Intel lent its hardware expertise to the fashion brand to bring to life the Q Founder smartwatch. The stylish Android Wear watch also landed in 2015. Intel's latest smartwatch venture is with New Balance for the RunIQ. Designed for runners, the Android Wear watch features built-in GPS, a heart rate sensor and Strava integration. New Balance, Fossil, Nixon, Swarovski. These names read very differently to the ones that kicked things off on the Android Wear front back in 2014. It's a trend that Fassett told us will continue, and could play a pivotal role in the long-term success of Android Wear smartwatches. While Intel is in a position to "go it alone" and build its own products, it still sees the value in partnering with companies like New Balance, who have good insights into consumers in their market. Fassett also believes that while fitness remains a driving force for wearable tech, it's not the be all and end all. "We think there's values in many markets. Our partnership with Tag Heuer, for example, already shows that," he said. "Our initial launch with Fossil also showed that too. If you look at the current state of the market, fitness use cases dominate. The strength of Fitbit and its continued good sales. If you look at the pivot of Pebble before its demise, [it] was trying to address more fitness focused features and even the Apple Watch Series 2 has orientated more towards fitness. A lot of that has to do with the fact that there are some very strong use cases in sensing technology and very engaging features around general fitness. "We still believe in general productivity features that connect back to your phone, staying in touch with the digital communication streams that people use on their phone. We think there are a number of use cases that don't need a mobile phone and are better served with a wearable form factor. Just checking notifications, updates from certain applications, ordering Uber, rating something. You'll see us continue to bring smartwatches to market but you'll see more in the vein of New Balance where there's an application that sits on top and speaks to two or three core feature values and that's what will drive adoption, while we are still driving use of the more general features." Intel, it seems, remains confident that smartwatches still have value, but what happens next? Fassett has his own ideas on how these very focused yet powerful smartwatches will continue to evolve. "I like some of the brands that we're seeing and hearing express interest getting into the space and I'd like to see more of those," he told us. "I'm excited to see more of these companies who already have a unique perspective on their market and customer being part of it. "I still very much believe in the technology paths that we're already seeing. There's a lot more to value to be extracted from things like physical sensing. Optical heart rate is one thing for instance. Contextual awareness is another very exciting avenue. We think there's a lot that can come from that, particularly when you combine it with advanced sensing so you understand the basics: not just where a user is, but actually the physical state of where the user is. We think that will start to create these kind of powerful use cases that will start to focus the smartwatch vision."